Contains: Two syringes (1.3 g; 0.8 mL per syringe) ONLY. 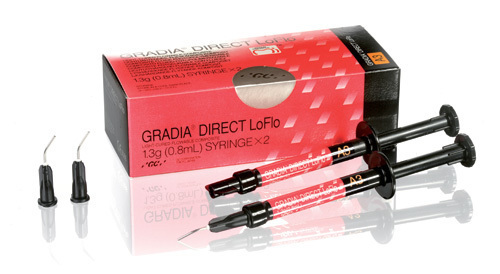 GRADIA DIRECT LoFlo is a light-cured, high viscosity flowable microfilled hybrid composite for simple restorations. GRADIA DIRECT LoFlo has 55% lower shrinkage than the leading flowable composite on the market, yet wears like a universal composite. This is a low shrinking, highly wear-resistant composite with ideal flow characteristics for final placement.